It’s brawny, it’s masculine, and it’s a… Hybrid? Pulling up to the school’s drop-off zone has never been quieter. Hybrid systems are no longer a new territory to Toyota and it seems lately you can find a Hybrid motor in any one of their available models – including the all new Highlander. After our First Drive review of the Highlander XLE AWD, we were quick to having a positive experience and found it to be an exceptional crossover for the growing family, the question now is will this new Hybrid alter our overall opinion? Our response, no it doesn’t. The Highlander’s new appearance gives off mixed feelings amongst the consumers. In order to attract more of the male influence the Highlander’s body style reflects a more virile, macho appearance – putting it on a protein shake diet seemed to do the trick. After all, they have to compete with the Dodge Durango, Ford Explorer, and Nissan Pathfinder. Kudos has to be given to Toyota for pulling it off. However in the world of Hybrid Crossovers, the competition is scarce leaving the Highlander to compete with the Nissan Pathfinder Hybrid. Of course being a Hybrid, it’s only available in the highest trim available, Limited. This enriches the appearance with LED daytime running lamps and 19” chromatic wheel covers that adds quite a smart stance. What would typically be an additional option to the Limited; the Hybrid comes standard with the Platinum Package that includes the Driver Technology Package (Safety Connect, Pre-Collision System with Dynamic Radar Cruise Control, and Lane Departure Alert with Automatic High Beams), as well as a Panoramic Sunroof, Heated Steering Wheel, and Heated Perforated Leather Second-Row Captain’s Chairs. Our sampled Gray Mica Highlander Hybrid featured $225 Carpeted Floor Mats and Cargo mat and $299 Glass Breakage Sensor as optional extras. 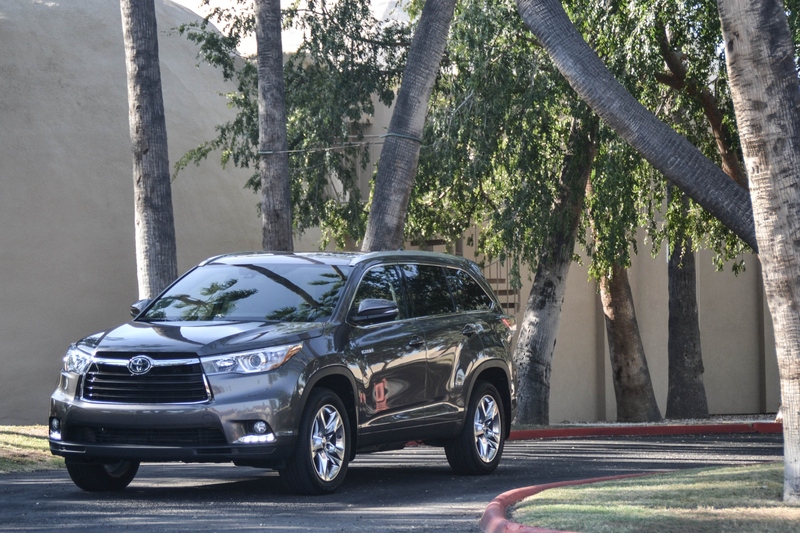 The 3.5L V6 found in the Highlander is no stranger to Toyota. That 3.5L V6 engine netted to an AC synchronous electric motor puts out a total 280-horspower. These motors connect to an electronically control CVT transmission, which gets the Highlander moving from zero to 60 in just under 8 seconds. But now, it’s time for us to get technical – so bear with us… The Highlander Hybrid uses a non-traditional all-wheel drive platform. The 3.5L V6 acts like a front-wheel drive system with no drive shaft connecting the rear wheels. Now, there are two electric motors, one at the front and one at the rear which makes for our all-wheel drive setup. The transition from gas to electric is near unnoticeable; it’s smooth and quiet – perhaps little too quiet. Yet they both work great together providing maximum power when needed. Having the Hybrid system doesn’t hinder the overall driving experience. Even with the sheer size, the Highlander is quiet with low road and wind noise. The brakes are strong and give you confidence in your stopping distance. You feel in control of the maneuverability with a good range of feedback from the tight steering wheel. What we really enjoyed though was the ride quality – the suspension was smooth enough for a comfortable ride yet firm enough to remind you that the road isn’t perfect. And when it comes down to MPG figures, that’s where it all counts the most – 27mpg city and 28 mpg highway is what the Highlander Hybrid is rated at; we came close average 26.5 on our average with roughly 350 miles of range on Regular Fuel. Like most, we live in the suburbs, we commute to our high-rise downtown office every day, dealing with the mundane traffic jams and listening to the dreadful traffic reports that do us no good. This is where the Hybrid works the most. At low or maintained speeds, the electric motor works in lieu of the gas engine saving on fuel and when the traffic clears the gas engine kicks on providing you decent acceleration to keep up with the movement of traffic. Like clockwork though, when the flowing traffic halts and the friction from the brakes provides charging to the electric motor so you’ll have a constant flow of energy when needed. It was impressive to us to see how much of the electric motor we used during our week and the day to day traffic nightmares we endure. After our experience with the XLE model, we were quite pleased with the new redesigned interior. Toyota has done an exceptional job with the overall scheme and final fit & finish. The three-dimensional dash uses a good use of faux stitched leather, wood trim, and silver accents to make up for the large space. Designed around the 8” touch screen display, the infotainment and Navigation system is quite attractive using touch sensitive buttons – they can be hard to reach from the driver’s seat, but the multi-functional steering wheel helps with that problem. Toyota makes for good use of storage incorporating the shelf concept into its design which we think everyone will enjoy. Our tested Highlander arrived in the usual business fashion with a black leather interior mixed with a dazzling bronze accent stitching. The Highlander Hybrid is only available as a 7-passenger crossover – second row features captain’s chairs with a middle tray table that can slide and recline for comfort and extra room as needed for the third row passengers. Unlike typical third row crossovers, a full size adult can fit in the back for a good period of time. But the driver and front passenger will have the best seats in the house featuring power adjustable seats with heated and cooling features. The three-zone climate control should keep everyone happy and passengers in the second row won’t be left out in the cold with heated outboard seats. At just barely over $51-grand the Highlander Hybrid is quite expensive, but then again, it’s a lot of car. What we thought was bound to be a boring week turned to be an enjoyable one. The Highlander continues to offer a gratifying ride and driving experience with a comfortable relaxing interior – and what kid wouldn’t love the panoramic sunroof?